Hooray for SPRING! Today we made a happy platter of springtime cupcakes!! :0)— Nevermind that it was a cloudy, cold day… and I’m going to overlook the snow shower this morning…. it is SPRING and we are going to make some cupcakes to prove it. We actually made a video on the making of these cupcakes (which I’ll be editing tonight & posting to the site)….but I thought I’d show you how to make a few of them for a quick blog tutorial! I love to paint in watercolors ( or at least, I used to!) ….and for me, painting with lemon extract and coloring gel is pretty much the same thing. With this cute cake topper, I started with a fondant egg cut-out, and then painted on my stripes! Easy peasy…. and such a cute topper for a lonely swirl of buttercream! Next up— springtime hats! 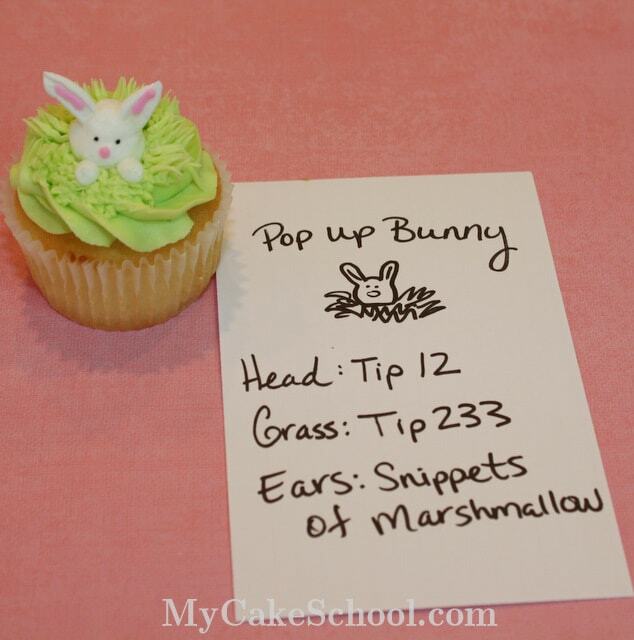 These cupcakes reminded me of the Easter hats that I used to wear when I was little. I used to LOVE shopping for an Easter hat and even little white gloves– fancy, fancy! 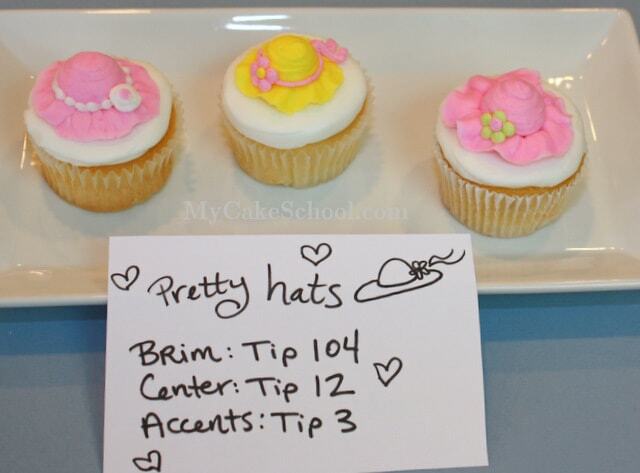 So, I had to include these sweet buttercream hats– which would fit perfectly into a fashion themed cupcake platter too! 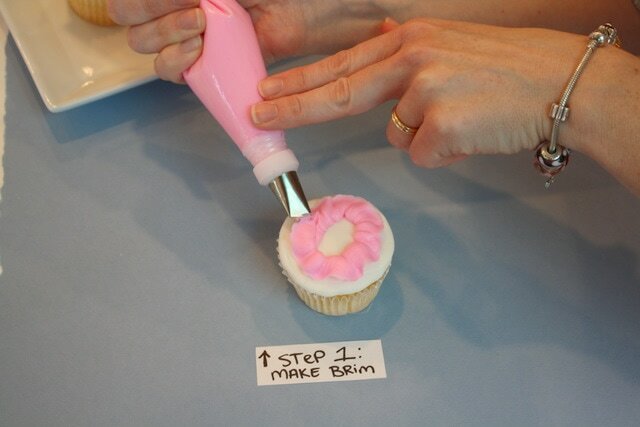 First, I used a petal tip (Wilton 104) to create a brim… looks like we’re making a flower, doesn’t it? 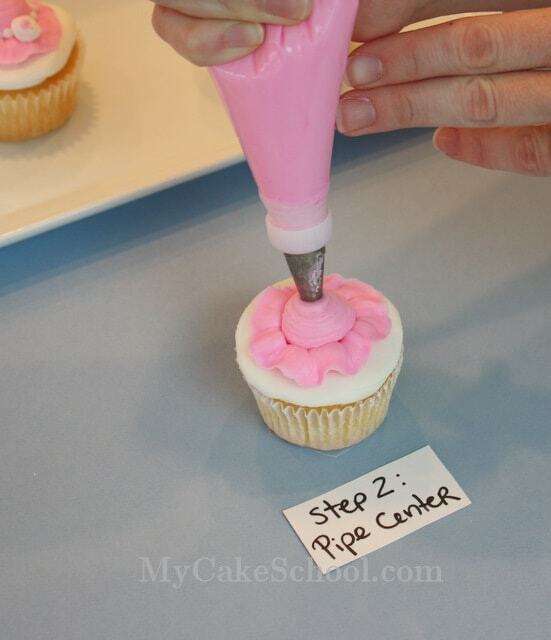 Then, a Wilton tip 12 for the center! I made three… don’t forget to give them a little accent or two! Here’s the rest of the Easter designs that I made today! Maybe you’ll see something you’d like to try out– have a great week! Love the hats, love the bunny! will be trying this for Easter, thanks so much. So stinking cute! 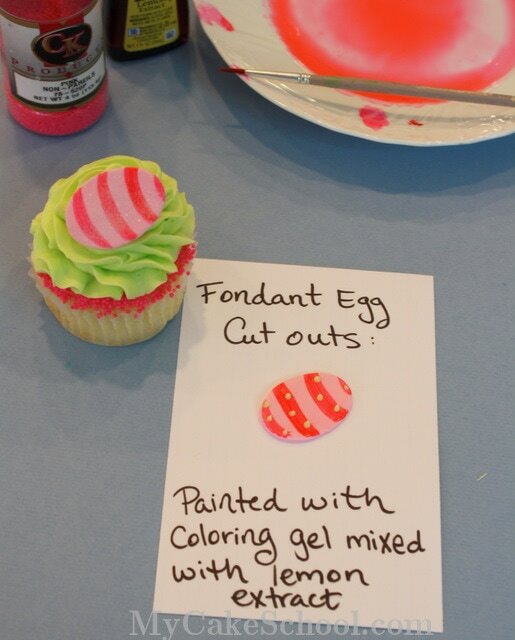 I can’t wait to do these for Easter! Hi! I LOVE your blog and your AWESOME ideas. I intend to purchase a year’s subscription one day, but can’t really afford it right now (alas, we live paycheck to paycheck and must coupon just to eat at the moment). To thank you for all you do, I awarded you the Stylish Blogger Award (link to measuringflower.com). Thank you for everything! I greatly appreciate it! Have a great day and God bless! All I can is YOU ROCK!!! My goodness, I love the hats, so simple-so cute! Can you tell me what pink you used to make the stripe on the egg? Great job, can’t wait to see the video! Thank you so much everyone for your comments!! I’m so glad that you like these–they were fun to do! –TJ, that is so nice of you!!! I really appreciate it! HoosierHomemade.com is running a giveaway for a free membership! You should enter! My2sunshines: I think that it was Wilton Rose. It was either that, or Americolor Deep Pink :0) — I just grabbed whatever pink was closest! Very cute ! I love the colors, do you recall but they are. Hi caronjen–Welcome to the site :0) –You can find out how to do this and other popular styles of swirls in the “Cupcakes” section of my videos–look for “Cupcakes with Flair”. These are so precious!! Melissa, do you think that I could use a cream cheese icing for the cupcakes? Thanks so much!! LOVE, LOVE, LoVE your website!! It is so much fun! Thanks for getting back to me so quickly!! Great Cupcakes!!! n Lovely Hats!!! can you pls tell me what Tip you use to make the Green Swirl?? is it 1M or 2D or something else? ?